The Low Down: Sorry-in-the-Vale is a small town in England where certainly something has happened since its founding by the Lynburn family back in the 1400s…and Kami Glass is determined to find it. For the Lynburn mansion is about to see the return of the Lynburn sisters and their families who have been in America for the last seventeen years. Instead of hailing their return, though, the townspeople seem even more silent about the family and their legacy. Kami’s investigative mind is ready to go into overdrive. People already think Kami’s a little odd, since she seems to frequently stare off into space and have little conversations with herself. But she’s just speaking to Jared, someone who took up residence in her mind so long ago she can’t ever remember him not being there. They share all of their thoughts and Kami can feel his presence, even though he is not real. Kami cons her acerbic yet beautiful best friend, Angela, into starting a school newspaper. That’s when Ash, son of one of the Lynburn sisters, shows up and asks to be the newspaper’s photographer. He seems to take a liking to Kami, which is strange since Angela is there and boys are usually struck dumb in her presence. Ash is beautiful himself, with his golden hair and his eyes the “ridiculous blue of high-summer skies.” Then Kami finds out about his delinquent, trouble-making cousin who has the same name as Kami’s mental companion. When she meets him in person, she is happy to find that the Lynburn Jared is everything her Jared is not: rude, sneering and cold. Kami’s obsession with learning about the Lynburns is only slightly derailed when she discovers a mutilated fox in a shack in the woods behind the Glass home. Once she starts her investigation into the cause and culprit, she begins to uncover connections and secrets that have been hidden for years. Then some of them are threatened, and one killed…are they getting too close to the truth? And once she discovers why she can communicate with her Jared, her relationship with her mother is forever changed – how could she ever do that to her own child? What is does that make Kami? Best Thang ‘Bout It: This book has one foot planted firmly in reality and one in the clouds. I love that you have no idea where the story is going, because the way there (sometimes on a motorcycle, sometimes walking) is deep, intricate and dripping with intrigue. It has a Gothic feel, with the huge mansion and the dark woods and the secrets; there’s a definite creep factor. The secondary characters are all fully developed and and interesting in their own right. I’m Cranky Because: The ending is a teeny-tiny bit of a let-down, but only because it’s ellipsis instead of a period. Should You? : Can you hear my thoughts? If so, then you can hear them screaming YES! 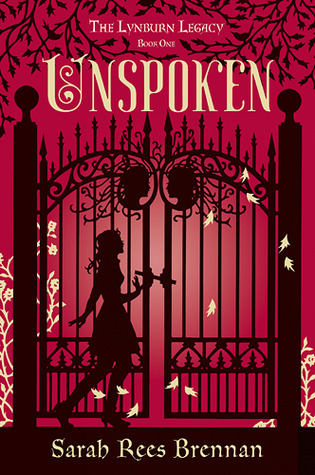 Unspoken by Sarah Rees Brennan was published on September 11, 2012 by Random House Books for Young Readers. So glad you enjoyed this one, I had a few issues with it , but it was a solid read! It hit all of my buttons! Read Kimba’s review at http://www.caffeinatedbookreviewer.com/2012/09/unspoken-by-sarah-rees-brennan-release.html. I’ve been seeing mostly good reviews roll in for this and it sounds like such a good book for me. I love the sound of it, and the way it seems to be sort of mocking itself, while also being good storytelling. I also tend to like my endings to be periods, though occasionally ellipses can strike just the right note. I read many books that I liked this month, but this one was a stand out. It just hit me in the right spot, I guess. Yes, you’re right…sometimes ellipses are appropriate.